Charlton Athletic Online: A New Dawn Chorus? Could this be the moment that turned Charlton season around, or just another false dawn? During the afternoon, from 4 o’clock onwards, I had been listening to another choral society I guess – less glamorously named but equally passionate – the covered end choir or north stand upper, call them what you will. These Charlton fans gave an outstanding rendition of all songs Charlton and really lifted the atmosphere at The Valley, so much so that they could in fact be the ones who have changed Charlton’s fortunes this year. The people rallied to the cause, a cause that was going rapidly downhill, yet possibly may have enabled the Addicks to turn that proverbial corner, and to start moving in the right direction. However, the problem was that, much as it was fantastic to hear, Charlton really shouldn’t have needed such a lift. The reason they did is because the manager yet again got things so hopelessly wrong. Once Alan Pardew had mouthed off to the media on Tuesday about making changes to the team for yesterday’s game versus Burnley, he was on dodgy ground. Renowned for saying one thing and then back-tracking, many fans thought that the only change made may be Mark Hudson returning after suspension, but Pards did this time stick to his word. Out of the starting eleven went Youga, Bouazza, Gray, and Holland, and in came Basey, Hudson, McLeod and youngster Josh Wright making his debut. This really did smack of wholesale changes, and once the game started, it was all one-way traffic, just not the direction fans wanted to see. Burnley were the men, coming up against upstart schoolboys; very quickly there was controversy. A Burnley pass forward was headed backwards toward his own goal by Ambrose (I think), and this left a claret shirted forward completely free on goal. Although the offside flag went up, as the ball came off the Charlton head, the referee waved away the flag and played on. The player collected the ball wide left, cut inside, beat a covering tackle and coolly stroked home past Nicky Weaver. Burnley celebrated; Charlton protested. Six minutes into the game and already a mountain to climb. Luckily, the referee listened to the protests, and agreed to check with his linesman. 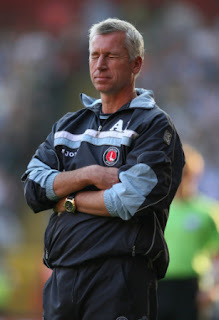 Now Charlton haven’t had much luck from the officials so far this season – when you are down, you get nothing Lennie once said…- but here could be that change of fortune we want. After speaking to his linesman, the referee changed his mind and awarded an offside decision, as the player was offside when the initial pass was made. This may have incensed the Burnley players and management, but if it was the correct decision, it was best to get there in the end. It made little initial effect on the game though, and very soon Charlton were behind. Wave after wave of attack continued, and a deflected shot finally rolled into the corner of the net. The game had been going less than 15 minutes. In that time, Charlton had not mustered anything of note; Bailey and Wright ran around a lot but couldn’t string a simple pass together; McLeod and Varney ran the channels but got nowhere; and Ambrose and Basey tried neat passes but were quickly closed down and lost possession. It was much the same for the rest of the half, although Burnley did seem to ease off a bit. This was Pardew’s team; his reaction to Tuesday’s defeat; his way forward. And it completely failed. Now if I had been of a similar nature to the two blokes behind me (who will be happy, no doubt, that Harry Redknapp will now be managing their first choice club), who left 17 minutes before the end on Tuesday, and started talking about catching early trains home yesterday just three minutes into the game, then I may well have not witnessed the second half revival sparked by the fans. Sure, Pardew admitted his mistake and hauled off Primus and McLeod at the interval, bringing on Lloyd Sam and Svetislav Todorov, but why place so much on young shoulders and ask for trouble? It is very galling to me that Josh Wright had to make his full debut in this game; why has he not been on the subs bench for ten games this year and been given the odd-ten or twenty minutes when games are safe or to be won, especially as Matt Holland’s legs do need the occasional rest every now and then! It’s the same with Izale McLeod; the guy has had a very bad knee injury and yet he just gets thrown in at the deep end without more than one reserve game. It was bound to fail! Why not get him on the bench and give him some up-to-speed game time and ask him to rediscover his impact player status before throwing him to the lions. You can say exactly the same about decisions to play Todorov, Ambrose and Primus, who have been selected when not fully fit this season. And what of Chris Dickson? How will he feel having been first choice reserve striker at the start of the season, and now he is sixth choice? Pardew (left) is not giving the players the chance to show their worth – McLeod is bound to get plenty of stick today for his showing, but he has had little opportunity since he joined the club. No doubt he will now be banished to the reserves, or shunted out on loan to “get some games”. It was the manner of his inclusion that was bound to fail, not his effort or skill. Anyway, back to the second half. Almost immediately, the shift of emphasis to players who could hold the ball up – Sam and Todorov – worked, and the crowd became lifted. Sam in particular made incisive runs at the Burnley defence, and (a now much fitter looking) Todorov linked play well between midfield and the front line. Sam put in dangerous crosses, and his play on the right hand side with Moutaouakil is simply dynamic. The whole game plan changed. All of a sudden, it was not men against kids. Free kicks were won, and chances did go begging. Then finally, a Basey free kick was headed in by Todorov (top pic). Our Bulgarian simply trotted back to the half-way line – no celebration there though the crowd went mad. Burnley were not finished though and a terrific shot crashed back off Weaver’s crossbar moments later, and was hacked clear. Now though, Wright was getting his passes away, Bailey was tackling, and the wide men were passing their way past defenders with ease. The crowd sang, the final whistle went, and spoils were shared. It was a good game, and either side could have won. It was great to leave The Valley without boo’s ringing out; hopefully Alan Pardew will recognise that and start to pick teams from the start that can do the required job. This is a point won, but will count for nothing unless the team – and manager – build on what was on show today. Charlton do not have to play the same side each week, but the balance must be right; the tactics appropriate, and the effort massive if we are to get away from a relegation dogfight. Pardew should thank that covered end choir for saving his bacon yesterday. Have we had any of those this season ?